Funeral services for James Floyd "Mr. Buddy" Oglesbee will be held at 2:00 PM, Saturday, May 5, 2012 in the chapel of Kilpatrick Funeral Home West Monroe. Rev. Butch Pilcher and Rev. John Foster will be officiating. Interment will follow at Mulhearn Memorial Park under the direction of Kilpatrick Funeral Home West Monroe. James Floyd "Mr. 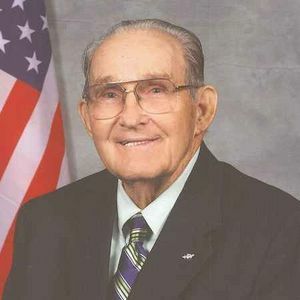 Buddy" Oglesbee, 90, left his worldly home for his heavenly home May 3, 2012. He was born Dec. 17, 1921, on his mother's birthday in Eros, Louisiana. The retired mechanical supervisor for the Illinois Central Railroad was both a Blue Lodge Mason and a Shriner for more than 50 years. Tuesday, May 1, He celebrated his 69th wedding anniversary with his wife, LaVon at the home they built in West Monroe in 1951. They adopted two children whom they devoted their lives to. No one could have asked for a better father. A train whistle made him pause and then tell a story from his 45-year tenure with the IC and then subsequent work with H.L. & H Railroad Services. Railroad memorabilia filled his home. His willpower and stamina were legendary and inspirational through Stage IV bladder cancer 16 years ago, quintuple bypass 11 years ago and a heart attack last November. He drove his car until last year, push mowed his yard until three years ago and even gave the right advice on plumbing last week. Mr. Buddy rode in parades all over North Louisiana and at the Shrine Circuses as a member and treasurer of the Barak Flivver Unit. His "iouga" horn couldn't be missed. He had been a charter member of the Barak Temple. He loved Jesus, his family, his friends, his Pomeranians, the Shrine Hospital for Children, gospel quartets, the railroad, gardening and West Monroe High School football. Mr. Buddy never met a stranger and always made people laugh. Mr. Oglesbee was preceded in death by his father M. F. "Doc" Oglesbee; his mother Beatrice Oglesbee; a sister Agnes Stuckey; and a brother M. C. "Jack" Oglesbee. Survivors include his wife of 69 years, LaVon Barnes Oglesbee; a son Gary Oglesbee and wife Beth of Huntsville, AL; a daughter Lori Oglesbee-Petter and husband Philip of McKinney, TX. He had one grandson Scott Oglesbee and one granddaughter Karen Fletcher and husband Lucas, all of West Monroe. He had three great grandchildren: Lexi, Jordan and Chase. He is also survived by his sister Helen Lewis and "favorite niece" Wanda Lewis as well as many other nieces, nephews and inlaws. Pallbearers will be Chuck Barnes, Bruce Korn, David Neal, Philip Petter, Ardis Stuckey, Fermon Tidwell. Honorary pallbearers will be the members of the Barak Shrine Temple and the Blue Lodge. Memorials may be made to Barak Shrine Temple Children's Hospital Fund, Noble James F. Oglesbee Memorial, 6620 Frontage Road, Monroe, LA 71202. Visitation will be held Friday May 4, 2012 from 5 pm until 8 pm at Kilpatrick Funeral Home West Monroe. The beautiful and interactive Eternal Tribute tells ames Floyd's life story the way it deserves to be told in words, pictures and video. May the Lord Jesus give your family strength at this time of sorrow. It is bitter sweet, but celebrate because he is at peace and walking streets of gold, really railroad tracks of gold with his Maker. Our prayers go to your family. Lori has shared good memories of her dad with me. Praying and knowing that Jesus is with you all right now!! I never had the opportunity to Meet Mr. Oglesbee, but I heard plenty of good stories from Lori. Our thoughts and prayers are with the Oglesbee family. I vividly remember Buddy meeting the bus of journalism kids at the truck stop in West Monroe on a late evening.....and bringing the latest episode of some current TV show, so the kids on the bus would have instant entertainment. What a guy! Now he rests in Heaven - the ultimate reward! Ms. O- I am sorry to hear of your father's passing. I remember the stories you use to tell us about Buddy and I know that he was a smart and kind man. I know you have those qualities too and must of gotten them from him. My prayers go out to you and your family during this time. Our thoughts and prayers are extended to you and your family. May the Holy Spirit be your Comforter.